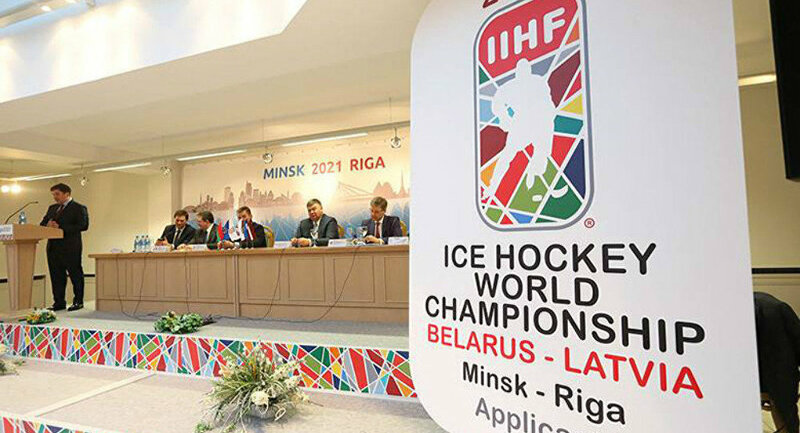 After a tight race between two strong applicants the 2017 IIHF Annual Congress allocated the 2021 IIHF Ice Hockey World Championship to the joint bid of Minsk, Belarus, and Riga, Latvia. The joint bid of the two neighbouring countries won by a tight margin against the Finnish bid with the cities of Tampere and Helsinki. The proposed dates are 7-23 May 2021. The two countries decided a few months to join together for the bid with the slogan “Passion. No Borders” that seeks to show a good relationship between a country in and another outside of the European Union, which they symbolically did at yesterday’s presentation with a video sequence from a space shuttle, and without borders. And it emphasized that the passion of the hockey fans from both countries is well known despite the fact that the two countries are neither among the biggest ones in population in Europe nor among the very top nations in the World Ranking. Belarus will be ranked 10th in the new IIHF World Ranking, Latvia 12th. Minsk is the Belarusian capital, with almost two million inhabitants and 3.4 million in the region. In 2014 it broke the World Championship attendance record that was reclaimed by the Czechs in 2015. For 2021 the 15,086-seat Minsk Arena, with two practice rinks on site, would be used as the primary venue. Minsk is the cultural centre of Belarus with numerous events and activities. The bid presentation recalled the great atmosphere of 2014, with its downtown fan village and fan zone as well as the convenience of Minsk Arena being just 15 minutes from the city center and the airport. “We learned a lot from organizing the 2006 World Championship in Riga and the 2014 World Championship in Minsk and with that experience can make things even better in 2021,” said Belarusian Ice Hockey Association General Secretary Yaraslau Zauharodni. Riga, Latvia’s capital, is just a one-hour flight away. It has 640,000 inhabitants and 1.4 million people living in a 100-kilometre radius. Latvia is renowned for its passionate fans traveling to World Championships all around the world, and the country hopes to recreate the great atmosphere of 2006 when the 10,300-seat Arena Riga was opened to host the Worlds. And they promise that a new practice arena will be built next to it. “I truly believe in a Europe with no borders and with passion. It would be a fantastic experience to show that Europe is about passion, not about borders. I truly believe in social responsibility. And that also means the prices for fans. They will not have to pay a lot. It’s just €2.20 for a beer and in Minsk it’s even cheaper,” said Riga Mayor Nils Usakovs in his speech. And Minsk Mayor Andrei Shorets added that in Minsk it’s even less, just one euro. New LHF President Aigars Kalvitis remembers the 2006 Worlds in Riga well. At that time he was the Prime Minister. “Hockey is loved so much in our country and we are thankful that our Belarusians friends invited us. In Cologne we had at least 7,000 to 8,000 Latvian fans who supported the team. We hope with this championship we will develop hockey in the region,” he said. Both arenas were opened to host the first-ever World Championship in each county, the Arena Riga for the 2006 Worlds and the Minsk Arena for the 2014 edition. The two venues also hosted the Final Olympic Qualification stages in 2016 as well as World Championships in the U20, U18 and women’s categories and the IIHF Continental Cup. They are currently mainly used by the local KHL teams, Dynamo Minsk and Dinamo Riga. Dynamo Minsk has the highest attendance in the KHL and the second best in Europe. “Ice hockey is number one in our countries. You would give us the biggest honour possible and the greatest event our countries can host,” said IIHF Council Member and BIHA Vice President Sergej Gontcharov. The 2017 IIHF Annual Congress unanimously approved to extend the IIHF Ice Hockey Women’s World Championship from eight to ten teams as of 2019. The change was recommended by the IIHF Women’s Committee and by the IIHF Council and today ratified by the IIHF’s member national associations to give women’s hockey another boost. “We started the discussion three years ago within the committee because we felt that since the Vancouver Olympics in 2010 women’s hockey has developed so much,” said IIHF Council member Zsuzsanna Kolbenheyer. With the increasing number of participating teams – 37 countries were entered in the Women’s World Championship program in six tournaments – and the increasing competitiveness the proposal was to extend the number of teams in the top-tier event to ten teams as of the 2018/2019 ice hockey season and with this step aim to discuss with the International Olympic Committee to have ten teams at the 2022 Olympic Winter Games in Beijing. The top division has been played with eight teams ever since the first tournament in 1990, the only exception being the 2004 edition that featured nine teams (when one team was promoted but no team was relegated in 2003 due to the cancellation of the top tournament in China because of the outbreak of the SARS disease). The IIHF Statutes & Bylaws will have to be amended by the 2018 IIHF Annual Congress in one year to formally implement the change and by then a playing format for the ten-team Women’s World Championship will be established and proposed by the IIHF Competition and Coordination Committee in co-operation with the IIHF Women’s Committee. – No team in the entire 2017 IIHF Ice Hockey Women’s World Championship program for all divisions will be relegated. This also means the last-ranked team Czech Republic will stay in the top division for 2019 and be joined by Japan as ninth team, which recently earned promotion. The tenth team will be determined next season. – Similar like during the last Olympic year, the 2017/2018 season will not include a top-level Women’s World Championship due to the 2018 Olympic women’s ice hockey tournament while the other divisions will be played in 2017/2018. At all these tournaments the winning team will be promoted to the next level and no team will be relegated. – These steps will create a ten-team top division for the 2019 IIHF Ice Hockey Women’s World Championship in Finland while the other divisions will operate with six teams as usual and be aligned accordingly with teams being promoted in 2017 and 2018 while no teams will be relegated. The 2019 IIHF Ice Hockey World Championship will take place in Finland, which confirmed its readiness to host ten teams. The dates and cities will be announced later. The lower divisions of the Women’s World Championship will be played in the 2017/2018 season and the hosts will be determined during the Congress this week.